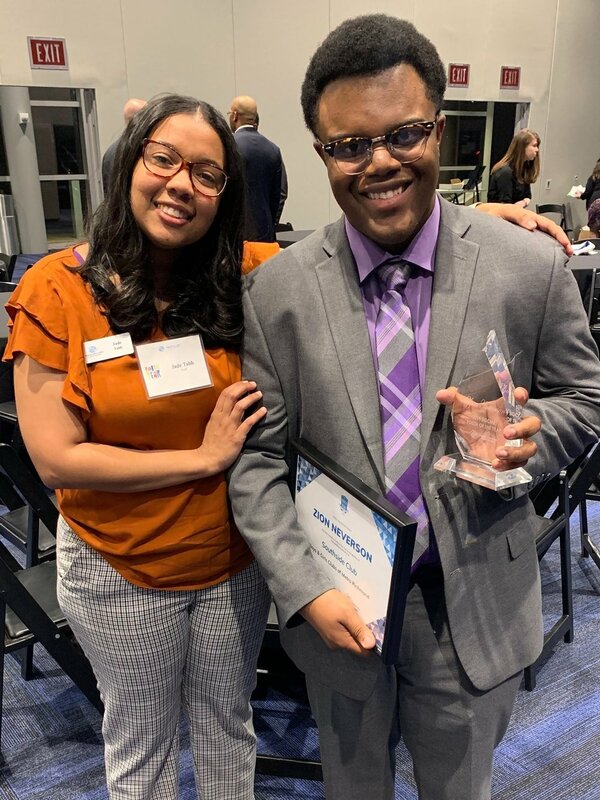 Zion Neverson will be blogging about his experiences as the 2019 Boys & Girls Clubs of Metro Richmond Youth of the Year. Check back periodically to follow Zion on his journey to the State Youth of the Year competition and beyond! Hey guys, thank you for all the love and support and advice that you gave me last week during State Youth of the Year it was much appreciated. The event was amazing. I got to meet different youth that are leading in their community and trying to make it better. Everyone got to the hotel on Thursday night. The entire group got together that night so we could get to know each other. We had time to make music with Community 50/50 which was the funniest and interesting part of my Thursday. I also got to listen to their stories and speeches as well. On Friday, we had to be up early for judging. I was the first one to go. I was nervous but confident. After everyone had their interviews and speeches, they announced the two finalists – Nola from Greater Washington & Satinika from Virginia Peninsula. After they did their final interviews, it was time for lunch and the celebration. My parents got to come to the lunch it was great to have them there to support me. The celebration was hosted by Steve Johnson, who won State Youth of the Year a long time ago in 1997, and who I also beat in ping-pong at Southside. We also heard from Micah White who made us all laugh. He told us “never let your expectations exceed your effort” and “fear nothing and don’t act above your title.” After that we all got certificates and pins for making it to the State Youth of the Year competition before they announced the winners. Me with Steve Johnson, Tevonte Grant, Ms. Jade, Ms. Chevonne and Mr. Miller after the celebration. It was an amazing time. And, although I didn't win, I felt privileged that I was able to represent my club and the Boys & Girls Club of Metro Richmond. But my most favorite part out of the whole week was hanging out with Ms. Jade. She’s helped me out a lot these past two months and she’s been an incredible help in preparing me. She’s not only become my best friend but like a second mom to me. I love the Boys & Girls Club and am so grateful for this opportunity. I am so excited to be taking over the Boys & Girls Clubs Instagram account for State Youth of the Year. Follow me and the other teens competing for State Youth of the Year. On February 27, 2019, I was announced as the Youth of the Year, it's one of the moments I’ll never forget in my life. I never really got to say a thank-you speech because I was out of words and I ran off stage. So before I continue this, I want to give the time to thank my parents, my mentors, and my friends that pushed me along this journey, without you guys I don’t know how I would have been able to write my speech or go up on stage to deliver it. Boys & Girls Clubs will always have a special place in my heart. The days after winning were amazing. I remember going around the whole day showing my award to my teachers, friends, and family. My confidence is big but getting to voice my speech to others made me feel more free. Alumni Coordinator Jade Tabb has served as Zion’s mentor during the Youth of the Year process. During the month of March, I have been preparing for the State Youth of the Year competition, which will be April 4-5 in Richmond. While doing this, I've had the privilege of being coached by Ms. Jade who has helped improve my personal brand, interview questions and speech delivery, which has been improved a lot. With her help and encouragement, she’s made this process a piece of cake. I also had the opportunity to be interviewed by the Richmond Free Press, which was incredible. I got to speak on a few things that I’m always excited to talk about like my community and what my generation has to offer. The Youth of the Year experience has been the most fun I’ve had. I've learned so much from adults and my peers, but the most important lesson I've learned from this whole experience is that we’re all special in our own way and we all have a story to tell to change someone's life. Sometimes we put masks over ourselves and we’re ashamed to show people who we are because we feel like we’re going to be judged or cast out. When I first started to go to the Club, I put that mask on because I was afraid of what people would see. Through my years of seeing people who were older than me, and seeing the way they carried themselves with their confidence, I would put them on a pedestal. Looking back at that situation, I asked myself, “What was the difference between me and them?’’ I discovered that there was no difference because we were all leaders – it’s just that we had different messages to present to people. Leaders are strong. Leaders are heroes. But, most importantly, leaders have a voice to change the world.